The Purple Line extension of the trolley could play a big role in a potential 2020 MTS ballot measure. But it isn’t clear that the line as it’s currently envisioned would be cost-effective or attract high ridership. San Diego is in the process of outlining the future of its transit system, with MTS planning a potential 2020 ballot measure. The content of the measure is undecided, but one possibility as the centerpiece public transportation item is the Purple Line, a trolley extension from the South Bay to Kearny Mesa through I-805 and I-15. The Purple Line was a major piece of SANDAG’s failed 2016 ballot measure and could be again for MTS, but it isn’t clear that it is a cost-effective project that deserves to be a high-priority element of San Diego’s public transit network. The idea of the Purple Line is not fully developed. What is known is it would follow the I-805 and I-15 rights-of-way, connecting San Ysidro with Kearny Mesa. It would either run in the median of the freeways, or elevated over them, with occasional detours to serve San Ysidro and SDCCU Stadium. 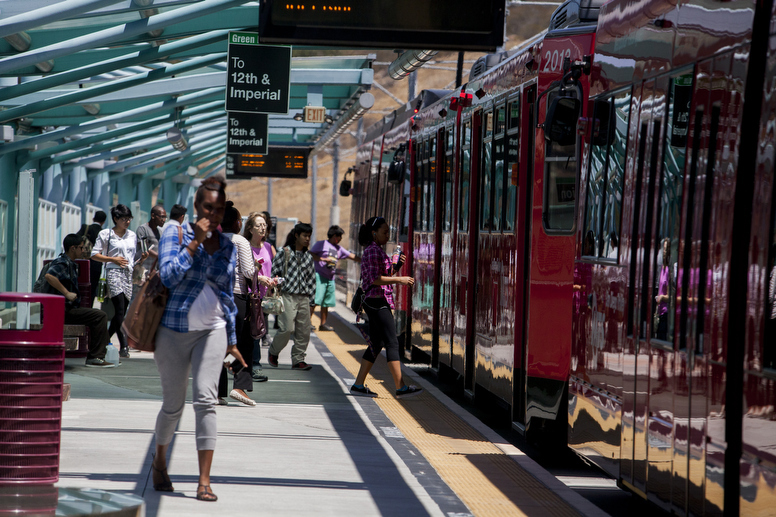 A SANDAG study from 2015 projects a ridership of 48,000 per weekday and an overall project cost of $4.2 billion, excluding equipment, for the 23-mile route. 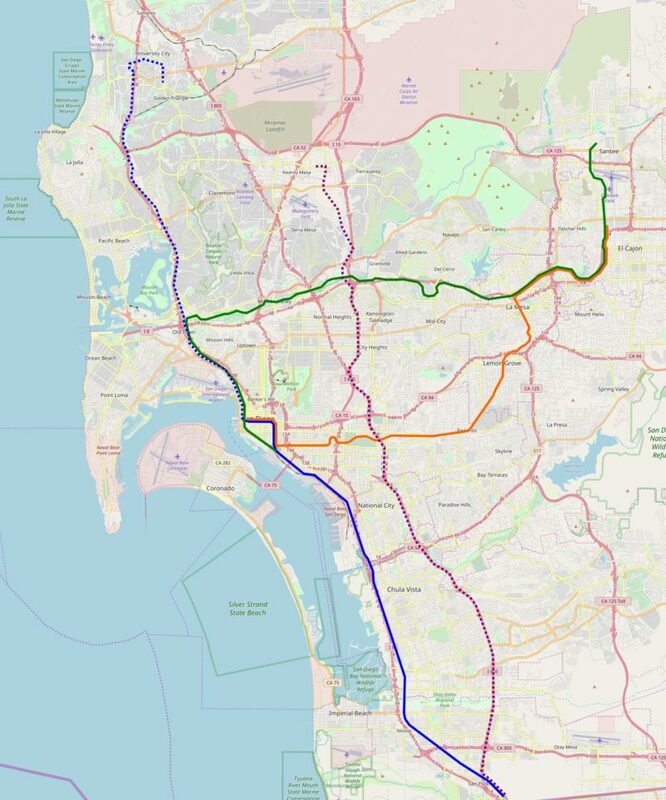 Colin Parent, executive director of Circulate San Diego, said the Purple Line was judged as a high-performance route thanks to SANDAG’s 2015 study, but ultimately was selected for the 2016 measure because of the ease of building in the I-805 right-of-way. But transit experts warn against choosing projects because they’re easier to build. Christof Spieler, a board member of Houston’s transit agency, recently published an atlas of every American rail and bus rapid transit system. In it, Spieler specifically warns against building mass transit exclusively on easy alignments where obtaining right-of-way is simple, such as freeways. He compares San Francisco’s BART system with the Metro in Washington, D.C.: Outside San Francisco and Berkeley, BART hews to freeways and disused freight rail corridors, whereas in several suburbs the Washington Metro has carved new right-of-way, often underground. The two systems are about equal in length, but D.C.’s Metro has more than twice BART’s ridership. Running a transit line where it’s easiest often means it doesn’t go directly to where people live, work or want to visit. That’s largely been the case with San Diego’s trolley, which runs almost entirely in pre-existing rights-of-way. The city has attempted to deal with this by spurring redevelopment near transit stations, but has been generally unsuccessful. Generating transit-oriented development is difficult near a freeway. Freeways are noisy and polluting, and nobody wants to live or work right next to them; people prefer locations a few minutes away. This frustrates any effort at redeveloping freeway median stations as walkable neighborhood centers. Successful examples of transit-oriented development in North America all involve rail transit in new tunnels, as in Washington, D.C., or on non-freeway rights-of-way, such as the transit-oriented towers of Vancouver, Canada. Think of a city as a circle, with downtown at its center. Transportation infrastructure works like lines drawn within the circle. San Diego is, of course, not a circle — because it’s on the coast, it’s a semicircle — but the concept still applies. The strongest urban rail lines are always either run through the city’s center, or circle the city center. 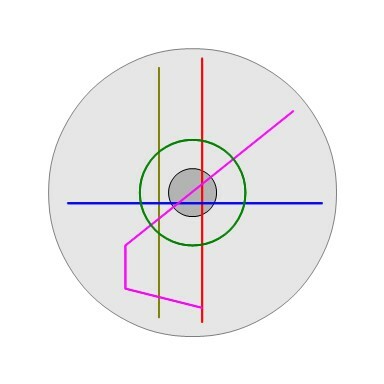 In the diagram below of a hypothetical transit system, the red and blue lines run through the city center, as does the pink line, except at its outer edge. And the green line circles the city center. In contrast, the yellow line on the left does neither. At its northern and southern ends, it acts like the red line next to it, transporting people closer to downtown, but then in the center it misses downtown entirely. Right now, all of San Diego’s trolley lines, including the under-construction Mid-Coast extension, run through downtown. The Purple Line would be the first not to, running north-south parallel to the Blue Line. These lines that do not cross through a city’s center are generally weak. They are uncommon except on the world’s largest subway networks. Even there, they tend to be the weakest lines. New York has one such rail line, the G train, which has low ridership and a poor reputation. Paris has two such Metro lines, Lines 5 and 10, which are on the weak side, and Line 10 has the single lowest ridership in the system; in contrast, its two lines circling the city center are among the strongest measured in passenger trips per mile of line length. Mexico City has three lines through downtown with very high ridership, and a series of much weaker lines that, like the proposed Purple Line, miss downtown. San Diego is not New York, with its dominant central business districts in Midtown and Lower Manhattan. But it still has a recognizable city center. Connecting Kearny Mesa and the eastern portion of the South Bay to the region’s rail network is worthwhile, but this connection should run through downtown. Kearny Mesa is no different from New York’s two biggest off-Manhattan job centers, downtown Brooklyn and Long Island City, which the G train connects. The route of the new South Bay Rapid bus, the 225, is instructive. The bus does not miss downtown, like the Purple Line. On the contrary, it connects Otay Mesa, well to the east of the Purple Line’s proposed southern terminus of San Ysidro, with downtown. That is where people in the South Bay want to go. Kearny Mesa is a large job center, full of office parks. The buildings are surrounded by parking, as all workers drive to the office, and the streets are designed with cars in mind. The main roads the Purple Line is planned to follow, Ruffin Road and Claremont Mesa Boulevard, are hostile to pedestrians. They feature narrow sidewalks next to fast car traffic, and pedestrians must brave many lanes of arterial traffic in order to cross them. There are mass transit lines designed to serve such communities in the United States, but their ridership is not high. In Los Angeles, El Segundo, a suburban job center similar to Kearny Mesa, has a station on the Green Line. The Green Line, a chordal line in the median of the 105 that barely misses LAX, is generally weak, but El Segundo is one of its weakest parts: In 2016 each of its three stations had about 1,000 boardings per weekday, whereas LAX had 4,000 and the stations east of LAX all had at least 2,000. The problem is that office parks are large and sprawling. Kearny Mesa has 90,000 jobs spread out evenly over six square miles; it’s bigger but less dense than El Segundo, which has 50,000 jobs in two square miles. The three planned Purple Line stations, then, would only serve a small minority of these 90,000 jobs, and the auto-oriented streets would restrict the ability of commuters to walk the significant distances from the station to the office. It’s nothing like downtown San Diego, where pedestrians can walk longer distances from the station to the office alongside streets with wide sidewalks lined with retail. Converting an auto-oriented office park to a transit-oriented one is possible, but difficult. Northern Virginia is currently doing so at one of the nation’s most famous suburban job centers, Tysons Corner. The Washington Metro opened an extension to Tysons in 2014, and since then the area has made changes aiming at transforming the place into a walkable urban neighborhood. These include street-facing housing development, generous sidewalks with ample crosswalks and urban parks. San Diego would need to make a concerted effort at sprawl repair in Kearny Mesa for there to be any hope of serving it with the trolley. It’s unclear what will be part of MTS’s 2020 ballot measure. Parent said it isn’t at all clear that the Purple Line will be included, and that even if it was, it could be as a freeway bus line instead of a trolley line. There are other competing projects for the same pot of money. It’s worthwhile looking at the region’s top priorities beyond the Mid-Coast extension. There’s a menu of options for what to do, including additional bus service, street reconstruction and additional radial trolley lines. For example, if Kearny Mesa is a priority, it could get a Green Line branch, or a branch going east from the Blue Line extension. But as it is now, the I-805 and I-15 corridors aren’t an ideal priority for a light rail line running in a freeway median that misses downtown but serves parallel to downtown without serving it, connecting to office park sprawl. The extent to which it is unlikely to see high ridership, paired with the $4.2 billion cost projection, suggests it is not a good use of money in its current form. This does not mean the concept is irredeemable: A trolley extension to Kearny Mesa paired with a comprehensive sprawl repair project could succeed, but not along the proposed alignment. The Purple Line as it is planned, however, does not appear to be a recipe for success. Alon Levy is a public transportation expert and writer at Pedestrian Observations.